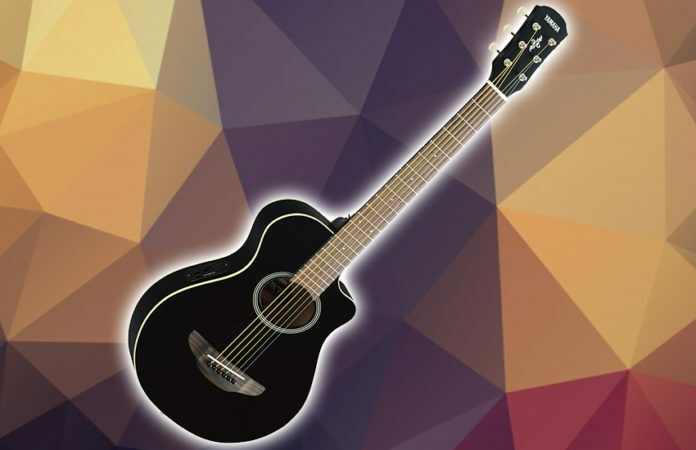 After the massive best-selling success of the Yamaha APX500II electro-acoustic guitar, it comes as no surprise that the maker would deliver a scaled version of the hit guitar. The Yamaha APXT2 is a compact 3/4 steel-string electro-acoustic guitar that is suitable for beginners, kids, and players with small hands. With the number of 3/4 electro-acoustic guitars that are available in the market, what makes the Yamaha APXT2 a cut above the rest? Find out. First look at the Yamaha APXT2 electro-acoustic guitar, it is impossible not to take notice of its handsome, slender appearance. It is inspired by the Yamaha APX5II anyway. The guitar has a laminated spruce top and meranti back and sides. If you do not already know, meranti is more cost-effective than mahogany, which we often see in more expensive guitars. It looks more natural, though, with the presence of the grain of the dark wood. It comes with two color options — glossy black and old violin-inspired sunburst. The nato neck is attached to the body at the 14th fret which is perfect for players with smaller hands. It has a fully-accessible rosewood bridge, 21 frets, dot inlays, classic-style covered tuners on the headstock, and a plastic nut and saddle. The Yamaha APXT2 also features a single cutaway and an oval soundhole. Quality electronics is what made the APX500II so popular. The Yamaha APXT2 is no different. It comes with ART-based preamp with a System 68 contact pickup. The preamp has a control panel that has the basic master volume, tone control knob, and digital tuner, something that all beginners will hugely benefit from. 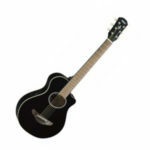 The electro-acoustic guitar also comes with a padded gig bag for protection and transportation. In terms of sound, you get decent quality with this guitar. You cannot expect the Yamaha APXT2 to be as good as a full-size dreadnought. While the tone and projection do not seem to be at par, it delivers more than enough volume. The bright sound is still natural when amplified. Owing to the limitations of the ART-based preamp, the guitar might not as good as the other acoustic preamps. But for travel and practice, it should be fine. The Verdict: Should You Buy Yamaha APXT2? The plastic nut and laminated woods could be our biggest gripe about this guitar. The Yamaha APXT2 electro-acoustic guitar may be an entry-level, there are a few reasons that outweigh all the bad stuff. Playability, style, and sound are just three of the very important criteria when looking for an instrument. If what you are looking for in a 3/4 electro-acoustic guitar is good for children & it has looks, quality electronics, and an affordable price tag, then, by all means, go get the Yamaha APXT2. Beginners, kids, travelers, and adults alike would enjoy this robust guitar to the fullest.